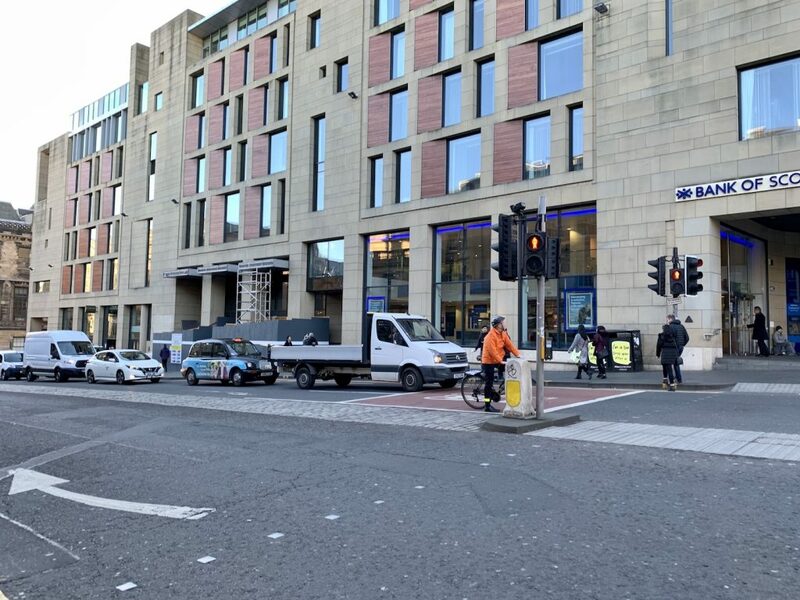 You really can’t go wrong with the Radisson Collection Royal Mile’s outstanding location. 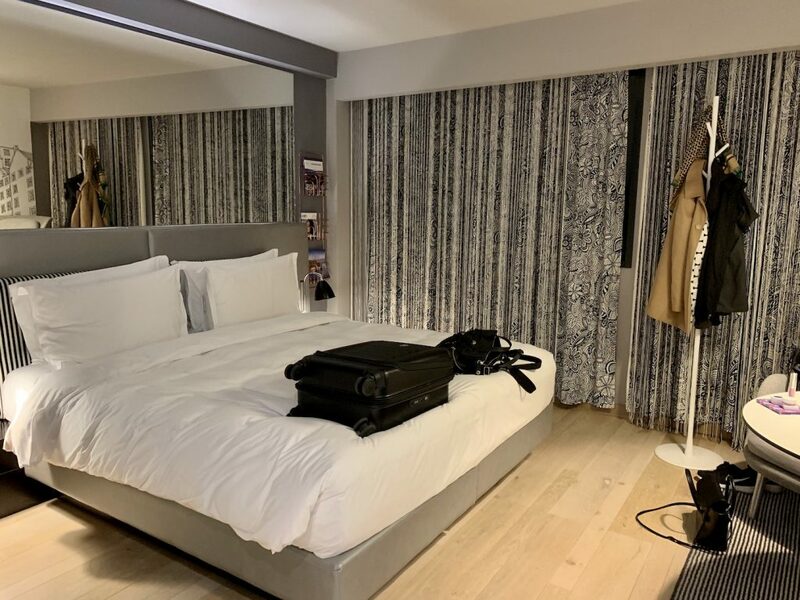 If you’re the kind of traveler who likes to be in the center of it all and as close as possible to all the major attractions, here’s my experience and first stay at a Radisson Collection hotel. 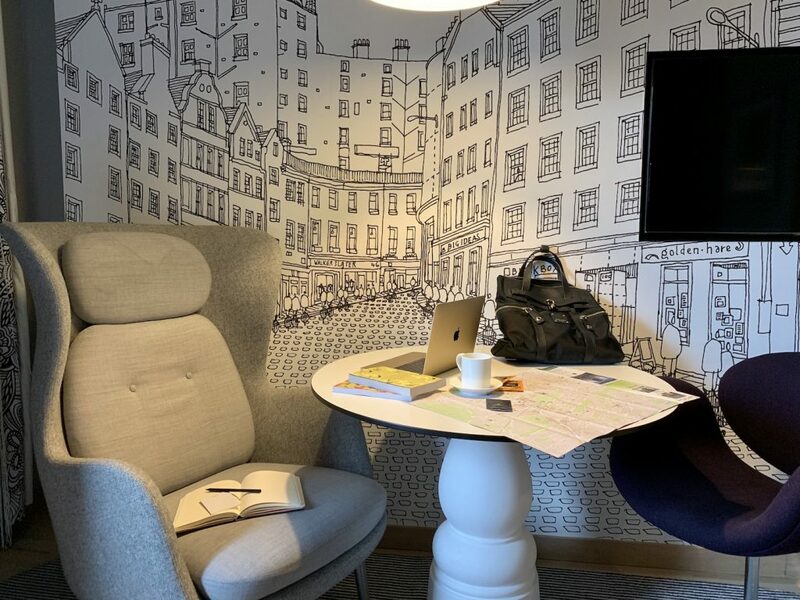 My stay at the Radisson Collection Royal Mile was booked through Last Minute Travel. You can book vacation packages, flights, hotels, cruises and more at Last Minute Travel. As a gift to you, I’m giving you a free year of membership for their Last Minute Travel Club (a $50 value). As a member of the club, you’ll receive exclusive deals that are only available to members. Plus, you can earn reward points on hotel bookings. Find out more about the club here and use promo code BethanyBFF to claim your gift. 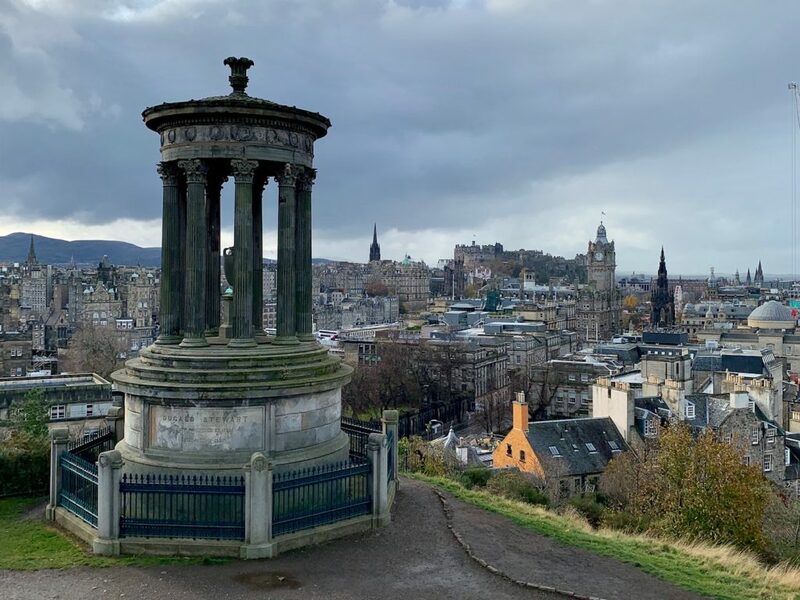 I arrived in Edinburgh at around 9:15 am. My ride into to the hotel from the airport was just under 30 minutes. 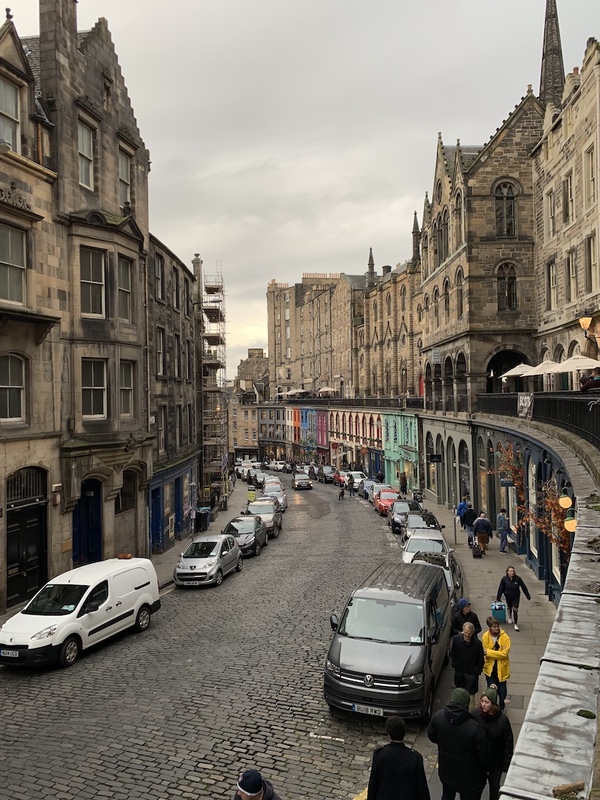 When you step right out of the front doors of the hotel, you’re at the Royal Mile – the approximately one mile long street that extends from the Edinburgh Castle to Holyrood Palace, with shops and popular tourist attractions along the way. Additionally, the hotel sits right around the corner from Victoria Street, one of the most photographed streets in the city. The Radisson Collection Royal Mile was doing some renovation to the front entrance when I arrived. 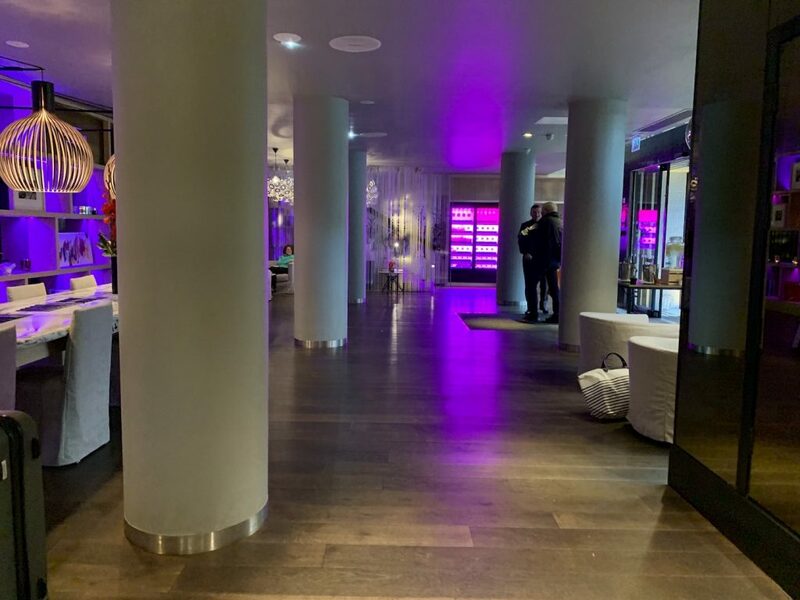 Walking in, my initial thoughts brought me back to my stays at W Hotels. 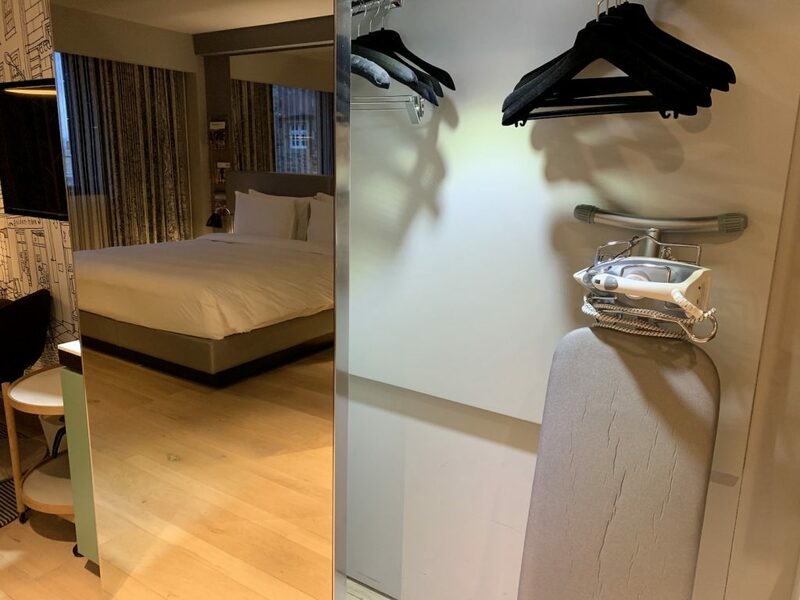 There’s colored lights and a boutique feel, which my experiences at W Hotels also had. There were groups checking out and others checking in when I arrived. I waited about 10 minutes before reaching a desk. 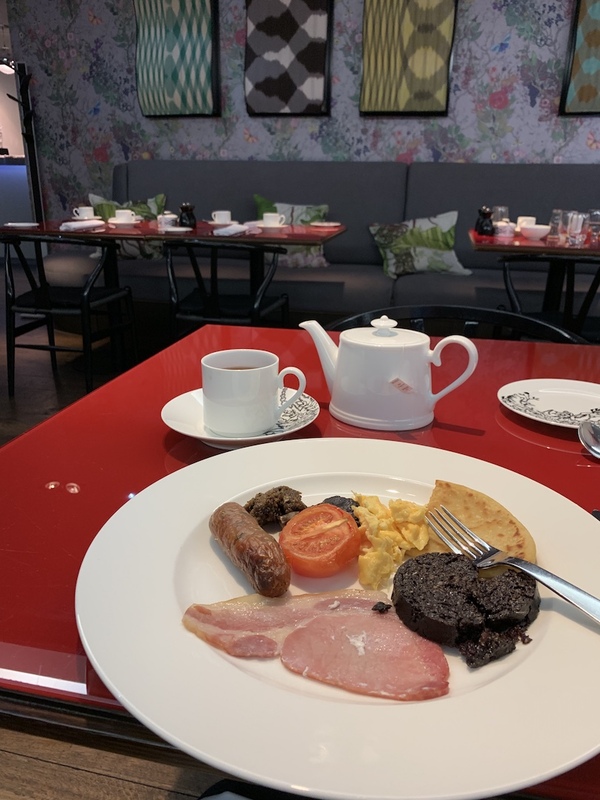 Since flights into Edinburgh from New York City typically arrive in the morning, I didn’t expect to be able to check in right away. There was an accessible room available but I decided to leave my bags at the front desk and start exploring. Staff were friendly and gave me map to start my adventure. When entering the front doors, immediately straight ahead is their bar. To the right is a staircase leading to their restaurant. There’s a small fireplace and four chairs tucked near the windows to the left. And past that area also to the left is a long table leading up to the reception desks. I had a king size bed in a Collection Room. There are five floors. My room was on the fourth. 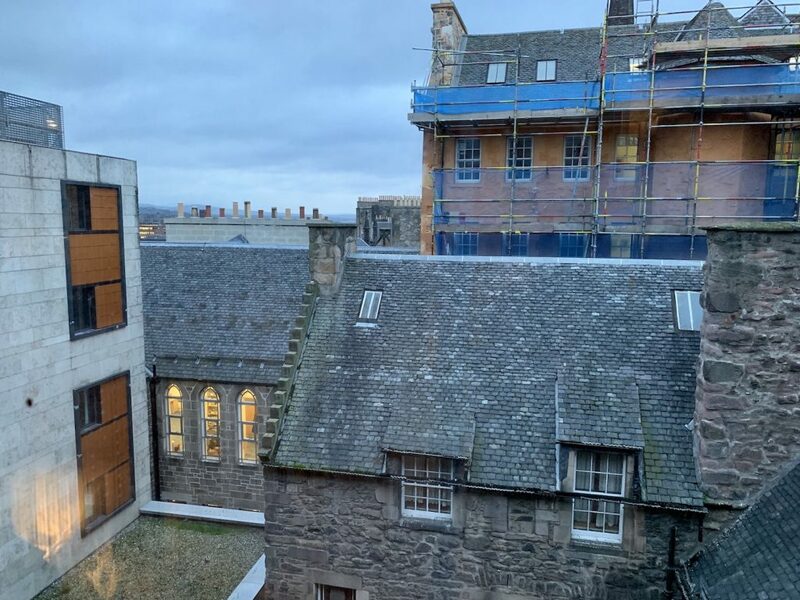 The Collection room is the standard room at the Radisson Collection Royal Mile. 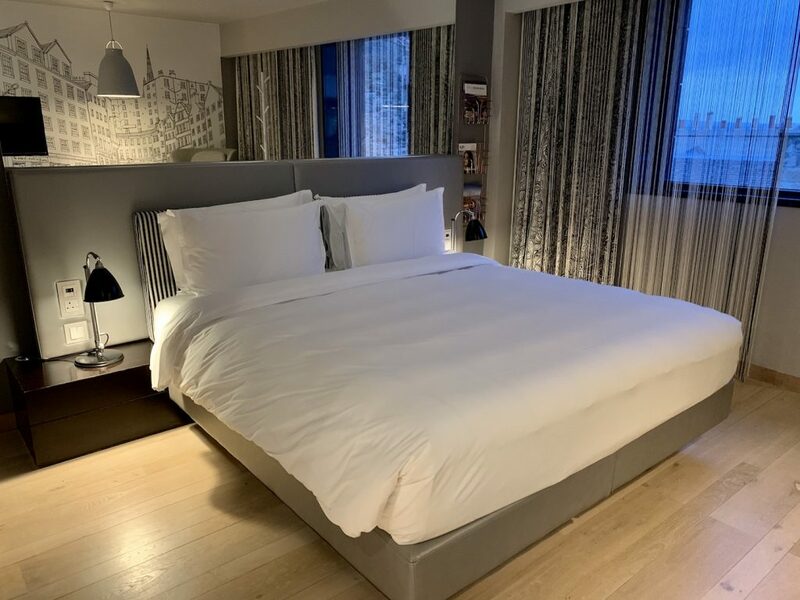 The bed was really comfortable, but overall the room is small, as expected in a city hotel in the center. The coat rack is a nice touch. As for the decor, I didn’t really pay much attention to the large mural-esque black and white drawing of buildings. That is until I went to Stockbridge and bought a book at Golden Hare bookstore. When I got to my room and took a look at the wall, I noticed the words golden hare right under the TV. This was the street I had walked on! The room is equipped with a workspace. There’s comfortable chairs and outlets right by the table to charge your laptop or phone while you work. 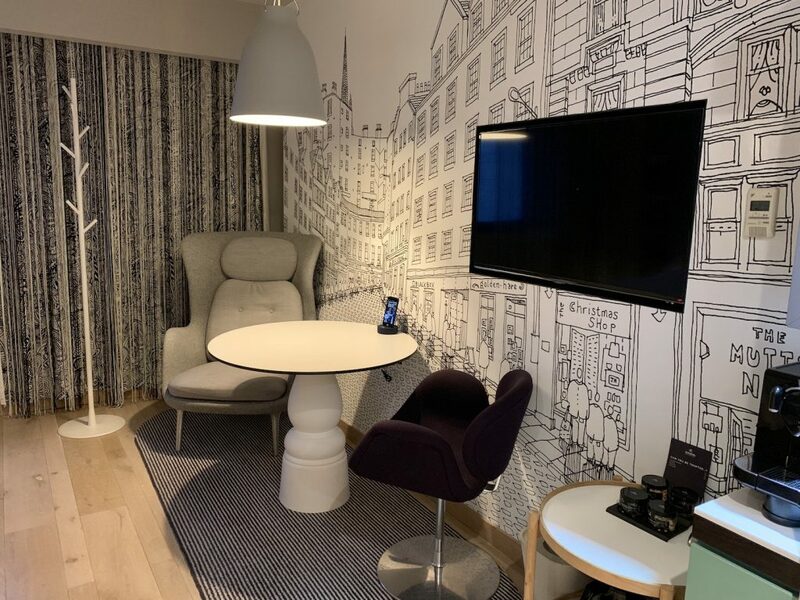 The room also comes with a Handy smartphone, a device I’ve seen in hotels around the world, which provides free international and local calling and internet on the go. 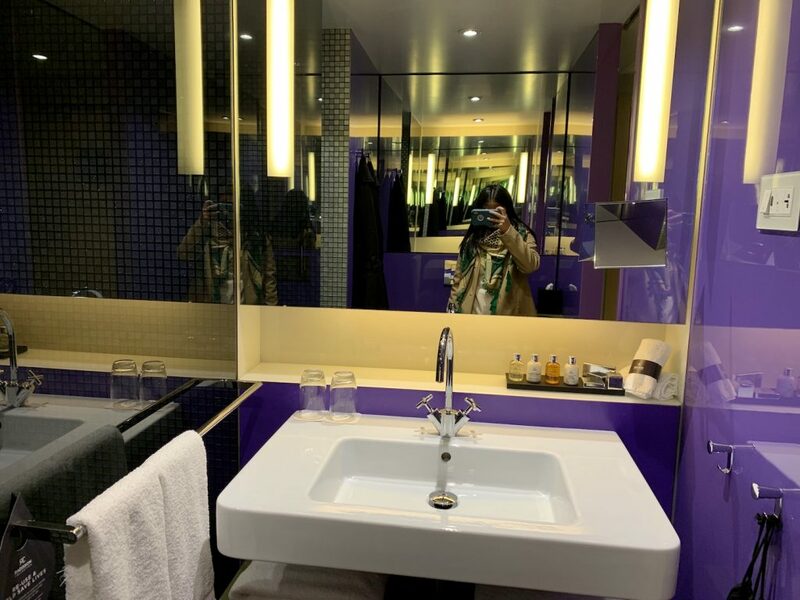 This room doesn’t lack mirrors. There’s one at the back of the bathroom sliding door and one at the sliding door of the closet. 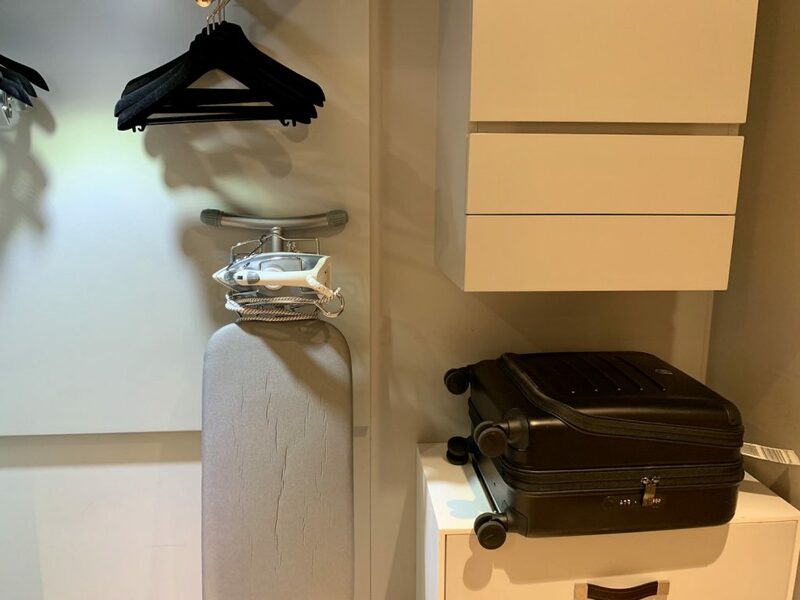 The closet is equipped with an ironing board, iron, safe and Radisson Collection branded slippers. There’s space to lay out your carry on sized suitcase. I just wasn’t a huge fan of the hanging system, which hangs in to out, instead of left to right. 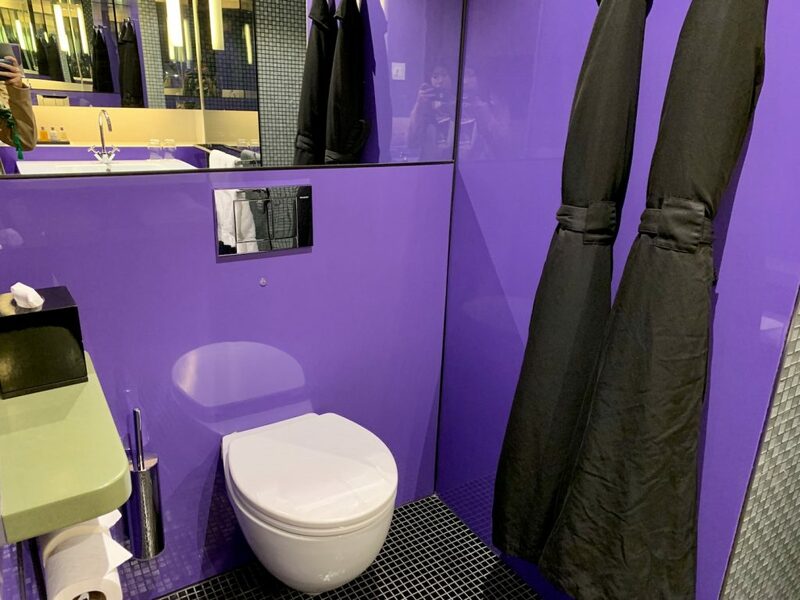 The bathroom had a black, white and purple color scheme. A heavy mirrored sliding door served as a separation between the room and bathroom. There was just enough counter space. The only downside was a little design flaw with the shower. It had a rain shower head but no curtain or door to close all the way, so a lot of water would puddle out into the bathroom while showering. 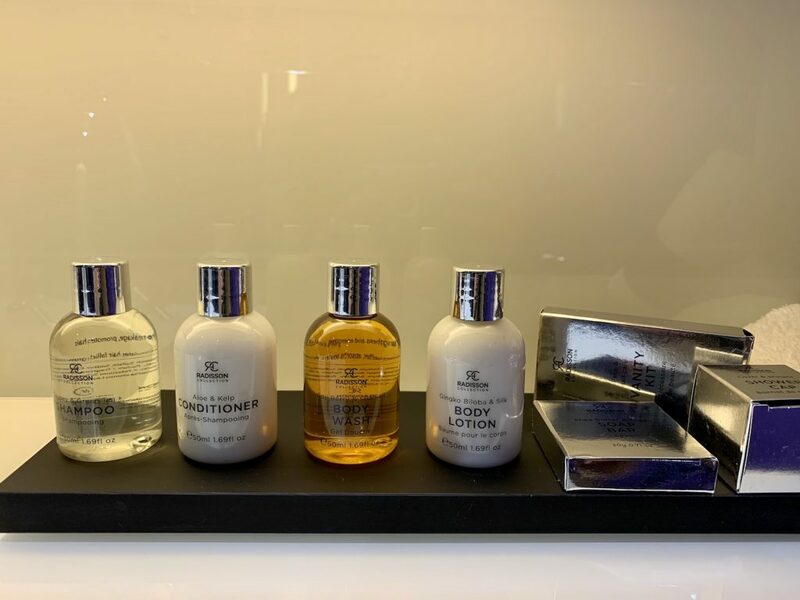 The Radisson Collection Royal Mile has their own branded Radisson Colletion toiletries, including shampoo, conditioner, body wash and body lotion. The mini bar is stocked with Radisson Colletion branded nuts and trail mixes. 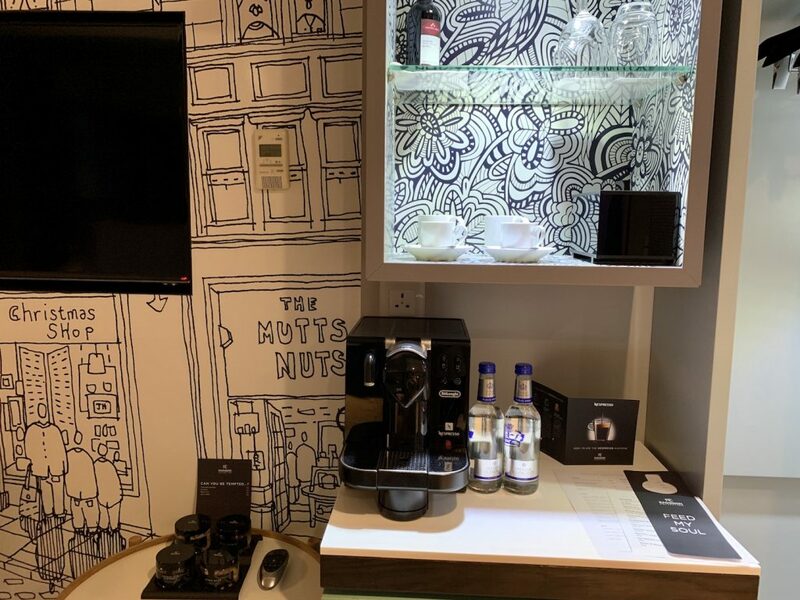 There were two bottles of complimentary water, a Nespresso maker and several bags of tea, including classic Twinings Breakfast tea and pyramid tea bags of Damman Freres. This was the view from my room’s windows. 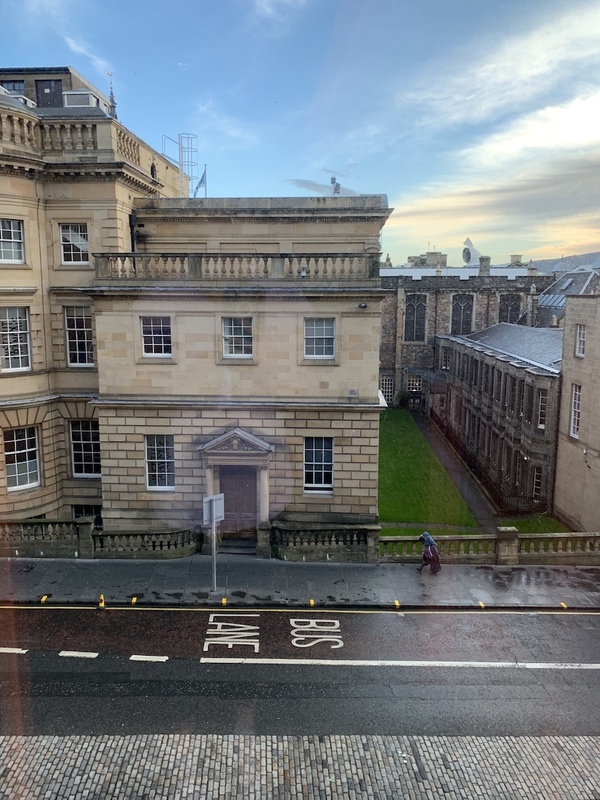 But on from the elevator banks, there’s views of the street and other buildings, which I can imagine can be seen from select rooms. 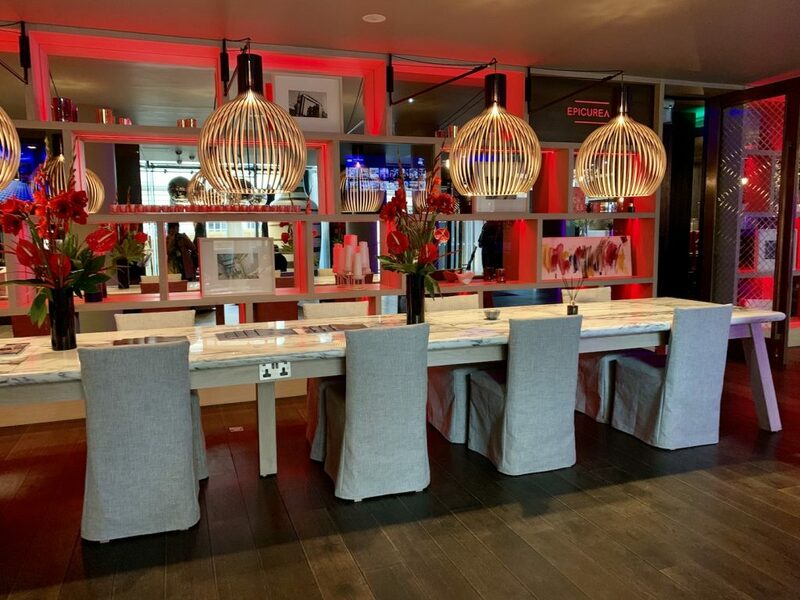 The Radisson Collection Royal Mile has one restaurant on the mezzanine floor of the hotel. The restaurant, Cucina is an Italian restaurant, which is also the place to have breakfast for hotel guests. Epicurean is Radisson Collection Royal Mile’s bar. The entrance is straight ahead from the front doors of the hotel. 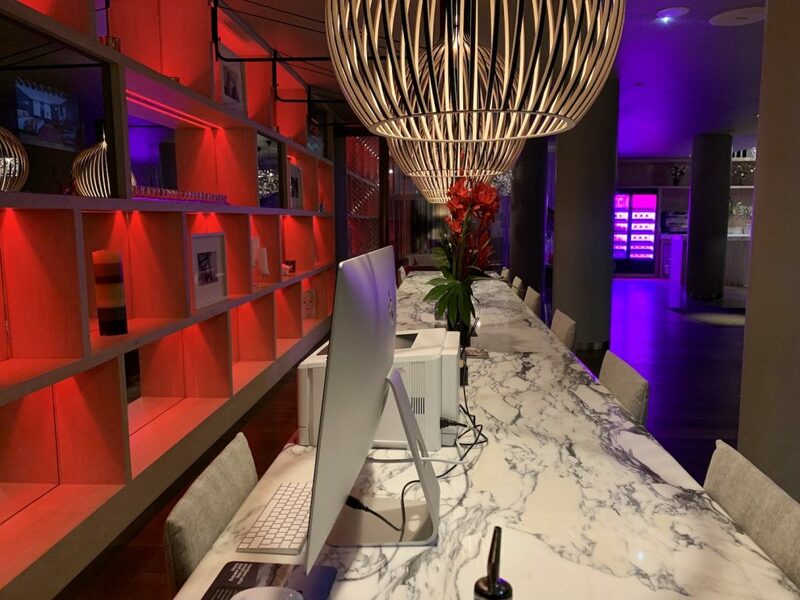 Apart from the bar area, there’s also several tables to lounge with marble tabletops. 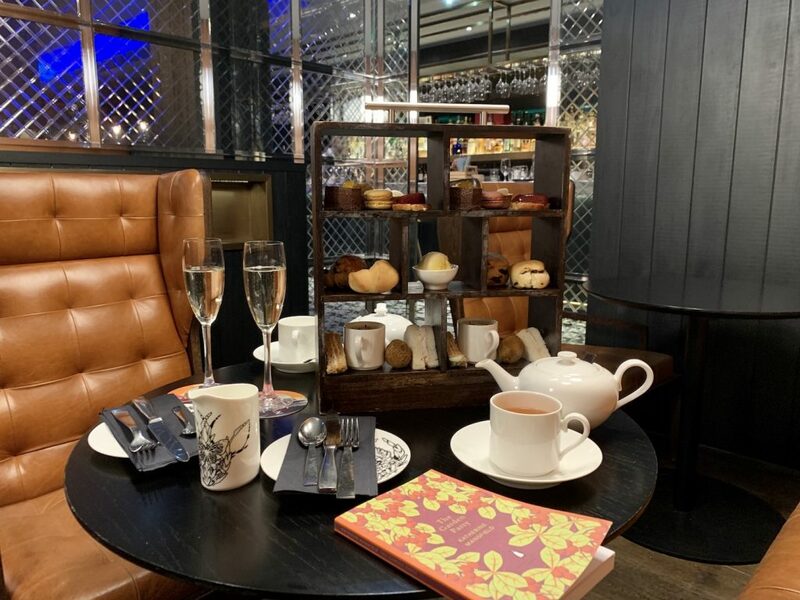 Apart from an extensive bar menu, Epicurean also serves afternoon tea. I went for a quick run on the treadmill on a Sunday morning. I had the whole place to myself. 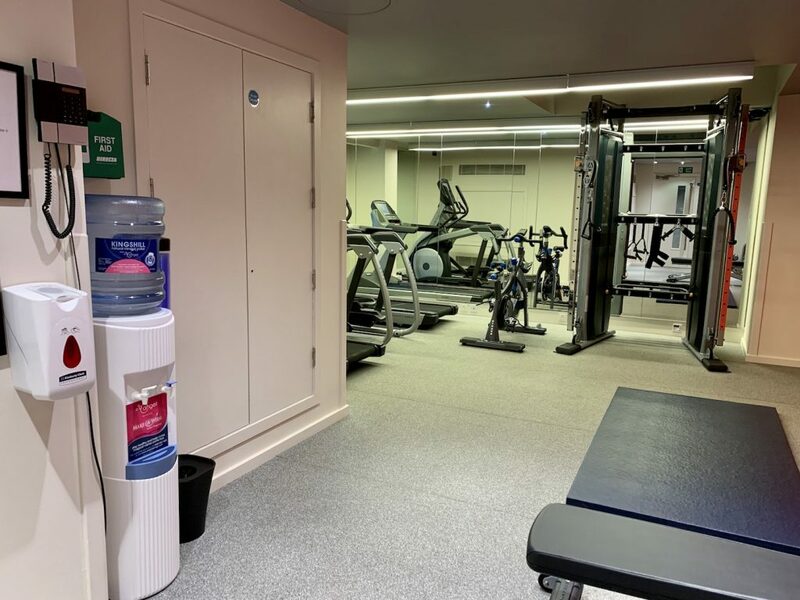 When inquiring about where the gym was (it’s on the first floor), I was also told I could go to the Radisson Blu, just a few steps away from the Radisson Collection to use their gym facilities and pool. Radisson Blu is a bigger hotel so their facilities were bigger than the two treadmills and few dumbbells at the Radisson Collection. All I had to do was show my room card to the front desk of the Radisson Blu. No complaints. A nice touch was when I arrived into the room, I immediately received a call to make sure everything was ok. Afternoon tea is served at the hotel’s Italian restaurant, Cucina. For a full write up and more photos of this afternoon tea, click here. I had no problems with the WiFi connection. 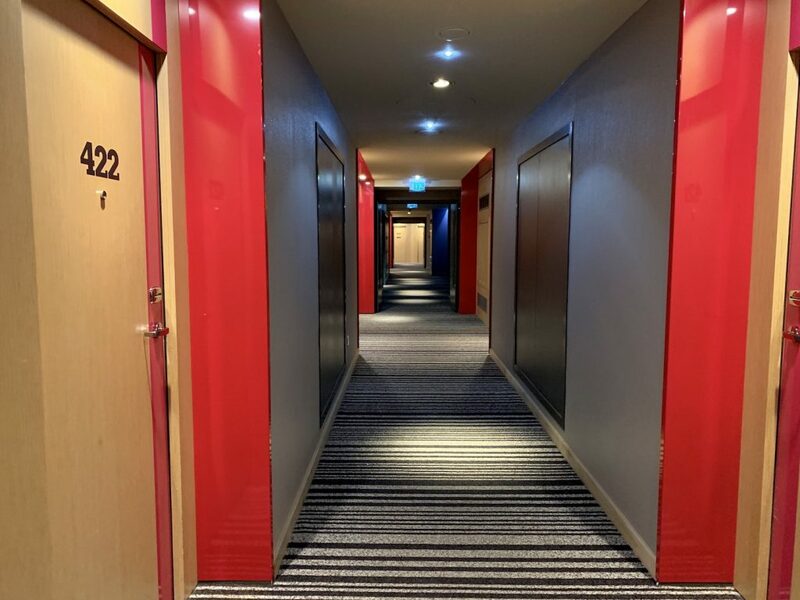 As a guest, just enter your last name and room number to access the free WiFi. 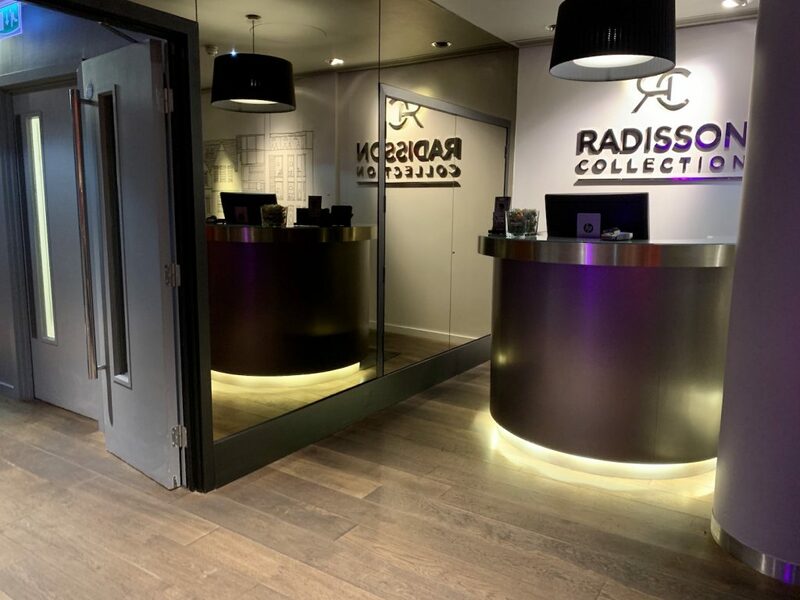 The Radisson Collection Royal Mile is on Twitter, Facebook and Instagram. Check out their accounts for updates and photos from around the hotel. For me, a hotel stay makes or breaks an entire trip. 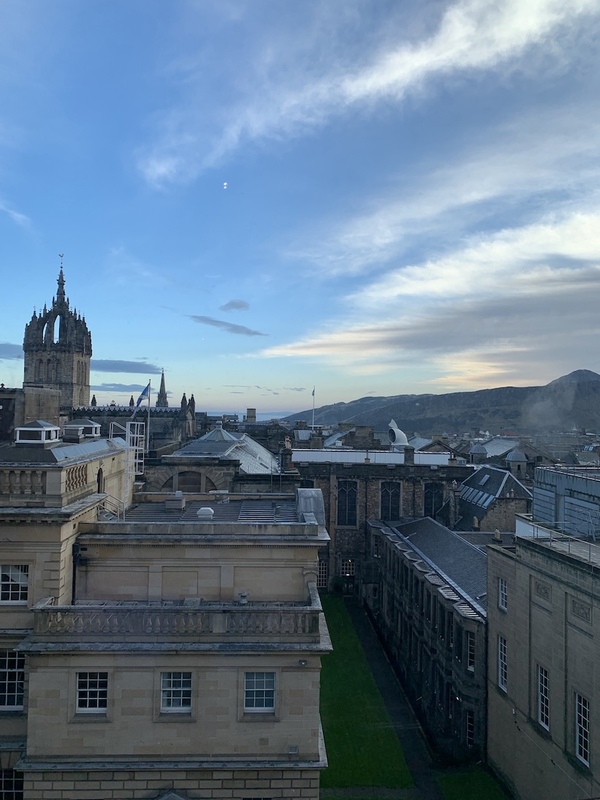 So consider this: if you plan on staying in your room often during your stay in Edinburgh, book a room in a higher category for a view and a bigger space. But if you just plan on staying in your room to sleep, you’ll be fine with a standard Collection room. 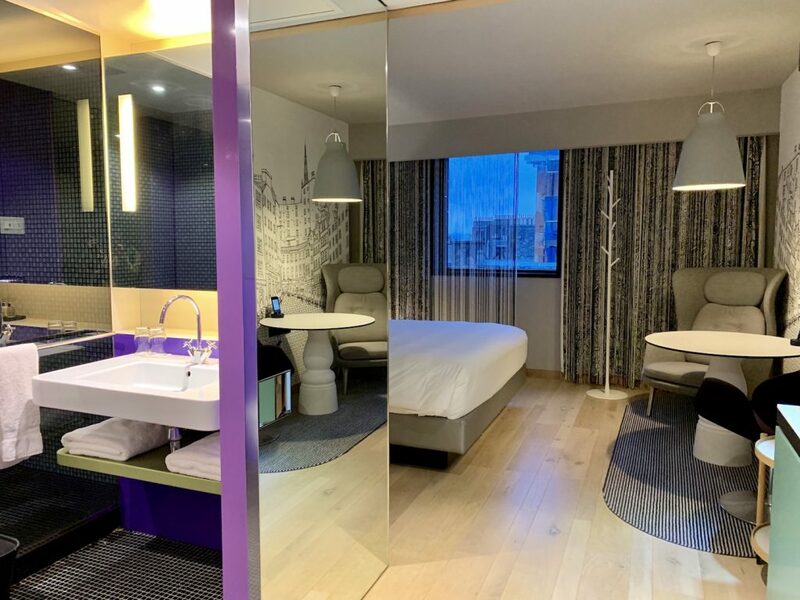 This hotel is all about its location, so you’ll naturally want to be outside exploring the city. Room Rate: You can check room categories and rates through Last Minute Travel. Join the Last Minute Travel club ($50 value) for free! 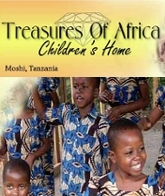 Find out more about the club here and use promo code BethanyBFF to claim your gift. Note: Thank you to Last Minute Travel for hosting me. As always, all views and opinions are my own.